Metric: Traps (these kobolds are tricksy). Overall: 5 traps. The Kobold moves from strength to strength. The cover is exquisite, content is varied and innovative with artwork ranging from good to awesome. The traps theme is interspersed with druidry, the new King of the Monsters (sporting a new look) and going beyond the DM's friend with situational modifiers and perspective-based dungeoneering. Content: 5 traps. Fantastic stuff. Lots of quality 4E love ranging from John Flemming's Rig This making use of ritual mechanics for player character set traps through Quinn Murphy's A Call to Awesome to provide situation or genre-keyed criticals to Phillipe Menard's Jack in The Box with it's traps that transform into monsters and vice versa and Jobe Bittman's Horakh, the newly-crowned King of the Monsters. Anthony Eichenlaub's Masters of Great Skill uses skill-based utility powers to provide players additional alternatives. Pathfinder love is also available: Alex Putnam's Blades from the Past offering magnificent toys for fighter-types. Pits of Despair by Andrew Hind offers 12 twists on the pit trap. Children of the Wood by Stefen Styrsky uses the Margreve as backdrop for nature magic, divine domains and a sorcerous bloodline. Collaborative Killers by Michael Kortes offers group tactics for combat and magic. An inside view on the 'Satanic Panic' via James Lowder's 'Those Dark Dungeon Blues' shows how far advocacy of games has come. In constrast, the interview with Margaret Weis talks community-driven games and the Cortex system and it's settings inspired by television. Monte Cook's Simulating Game Reality talks about core assumptions of the rules providing flavour for a game world in a thoughtful discussion. Book reviews offer more delights though all the books are parts of ongoing series, including the latest Naomi Novik as well as gifting ideas for those who don't yet game. Mario Podeschi's Side-Scrolling Dungeons is great stuff, showing the virtue of three dimensions and platforms. While the article uses 4E mechanics in it's example it can be adapted for any game and may offer inspiration for other genres also. Finally the Cartways, where Wolfgang Baur introduces us to the urban underworld of Zobeck including The Smuggler's Market and the Black Chamber of Anu-Akma could easily be adapted for Pathfinder, d20 or 4E. Art/Layout: 5 traps. Cover… (insert Homer Simpson-style drooling). Is a print available? Interior art compliments with high points being Nature's Orders, the weapons from Blades From The Past, Horakh and the tower in Going Vertical. Minor (and I mean minor) layout glitches on the 4E articles are the only foot wrong - a two column layout for those articles would fix this. On a lighter note, Stan! 's cartoons pull two aces this issue - the 10x10 toon will be funny as long as Desperate Housewives is broadcast. In closing, this is how a PDF magazine should be, colourful, interesting content, articles bookmarked and with unobtrusive links to products and related sites. 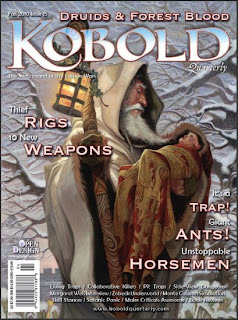 It's particularly neat to see the RPG blogosphere spawning articles for publication and proves there's plenty of life in tabletop RPGs even if some parts of the industry may feel otherwise.